This would be the first of Warren William’s many screen detective appearances. 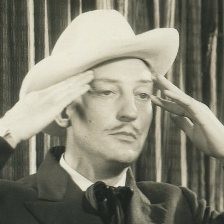 While the climax may be a bit of a clunker on this one, William, here as Philo Vance, plays the part as smart as William Powell ever did, with just enough touches of humor to keep his Vance human. 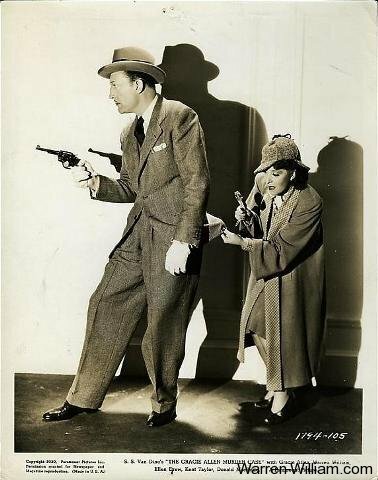 Powell originated S.S. Van Dine’s detective on the screen and played Vance in four of the first five Philo Vance movies, the first three at Paramount, the previous entry to Dragon, The Kennel Murder Case (1933), also at Warner Brothers. Vance had also been played by Basil Rathbone in MGM’s entry to the series, The Bishop Murder Case, in 1930. With one film remaining on his Warner Brother’s contract Powell actually turned down a fifth go as Vance, selecting The Key (1934) over The Dragon Murder Case and one other film to complete his deal with the studio (Bryant 95). Less than a month after completion of The Key, Powell would wrap his first film at MGM, Manhattan Melodrama (1934), and start work on the detective film which would give him his most famous role, as Nick Charles in The Thin Man (1934). The Dragon Murder Case would not only be Warren William’s first of many detective films, it’d be the first film he completed to be released under the newly enforced Production Code. Prior to Dragon William had completed work on loan out to Paramount playing Julius Caesar in Cecil B. De Mille’s classic Cleopatra (1934). With his classic pre-code titles behind him and similar roles now impossible, The Dragon Murder Case would turn out to be a bit of luck for William’s career going forward with his own most successful detective series just ahead of him in his next part: as Perry Mason in The Case of the Howling Dog (1934). The comparisons to Powell are inevitable when you watch William as Vance. The differences between Powell’s final Vance of The Kennel Murder Case and the sleuth’s next screen appearance as played by William in The Dragon Murder Case are negligible. Powell is perhaps a little more jaunty than William, though not nearly as loose as his later Nick Charles. William has more of a dry wit as Vance, he’s the greater intellectual, somewhat of a snob even, most evident when he’s tossing about Latin scientific names while discussing the Stamm’s tropical fish collection. Vance of Dragon seems to play things closer to the vest with the traditional law enforcement than he does in Kennel, but that’s a product of the script and not a difference of Powell versus William. This baby isn't in any of the tanks ... but it could be in the pool! In all, each man’s Vance is very much who they traditionally are, though not necessarily who they are at their best. Warren William takes on the role as if it were one of his more dramatic, with none of the winking debauchery that we love him so much for in his famed pre-codes, while pre-MGM William Powell, already an experienced screen veteran, has not quite fully developed into the star whose personality shined through so much more in The Thin Man movies and other MGM blockbusters. While each man plays Vance as Vance, each is colored enough to be identifiable as the individual work of each actor. The film itself is interesting even if it eventually disappoints. Shades of horror hang over The Dragon Murder Case as the suspect for much of the picture is indeed a dragon, it’s potential existence all the more enhanced by the insane cackling of sexagenarian Helen Lowell throughout the movie as the Stamm family matriarch. At one point Vance brings up the possibility of a “new kind of monster,” perhaps the result of Mrs. Stamm’s oldest boy, Rudolph (Robert Barrat), a scientist and explorer, having “been poking around in comparatively unknown forces of the world” for many years now. “And he might have brought home a school of mermaids too,” replies Eugene Pallette, here in his fifth go around as Sgt. Heath, having previously played the role in each of the Powell entries to the series. Thanks to Rudolph, who spends the night of the murder sprawled out drunk, The Dragon Murder Case sports a solarium packed with fish tanks as one of its main settings. As a long time aquarist myself I got a special kick out of Warren William referring to a species of mouthbrooding Tilapia, though the line certainly brings forth some of that pretentiousness I mentioned earlier that was lacking in Powell’s portrayals. The old style tanks with the thick steel frames were a kick to look at, especially beautiful in such a large collection, and the focus on the Betta splendens, aka Siamese Fighting Fish, made me wish Warner’s and First National would have gone all out and splurged for some Technicolor sequences. Those Betta, whom the party attendees revel at watching in battle, serve as a heavy fisted metaphor for the party itself, a gathering comprised of people who despise one another. As the fish tear each other to shreds Greeff (William B. Davidson) remarks to Tatum (George E. Stone) that there’s “One thing about fish. If they dislike one another they fight til they kill.” Greeff then looks across the room to Gale Leland (Lyle Talbot), who isn’t very well liked by anyone at the party, save Rudolph’s sister, Bernice (Margaret Lindsay). Leland is in love with Bernice, but Bernice is engaged to “Monty” Montague (George Meeker), whom Leland openly despises. The final guest at the Stamm party is Ruby Steele (Dorothy Tree), who spotted a broken down Monty at a local gas station and gave him a ride to the party. Ruby had had a fling with Monty and still has feelings for him. Also inside Stamm house are Trainor (Arthur Aylesworth), the butler, who is seen moving suspiciously about the premises several times, and last but not least, Mrs. Stamm (Helen Lowell), Rudolph and Bernice’s mother, who’s called “a mental case” by one character and leaves Pallette’s Sgt. Heath betting that “she could tell a nifty bedtime story,” after Mrs. Stamm goes on at some length about the Dragon. Part of what makes The Dragon Murder Case a fun sequel to The Kennel Murder Case is that other than Warren William having replaced William Powell, the remainder of the law men called to the scene are back reprising their roles for at least a second film in a row. As I already mentioned the gravelly voiced Eugene Pallette played Heath in all four previous Powell incarnations of Vance. Also returning in The Dragon Murder Case are Robert McWade as District Attorney Markham and Etienne Girardot as Dr. Doremus, the cranky coroner* who’s always having his meals interrupted. Prior to The Kennel Murder Case both the Markham and Doremus characters were still included in the films, but played by different actors. Warner’s staple Robert Barrat was also in Kennel, but since his Archer Coe was killed in that one it’s no surprise that he’s made up as an entirely new character this time around! *Trekkies, I have to wonder, is Dr. Doremus an influence on Dr. Leonard “Bones” McCoy of the original Star Trek series? In The Dragon Murder Case, Doremus scolds the other characters and then declares, “I’m a coroner, not a philosopher.” I would have just dismissed the line if I didn’t find him saying something similar several times in The Kennel Murder Case, first stating, “I’m a doctor, not a magician,” and then, “I’m a doctor, not a detective,” and finally, just grabbing a laugh from anyone paying attention, “I’m the city butcher, not a detective.” That reeks of Bones! D.A. Markham is the straight man who bounces ideas and proclamations Vance’s way, with Vance typically taking things a step further and leaving Markham impressed by his genius. Heath is comedy relief playing foil to both Markham and especially Vance. A typical exchange between Heath and Vance comes after yet another swerve in the case when Heath remarks, “My knowledge of criminology leads me …” Vance interupts him: “–to suspect somebody else?” Heath laughs nervously. He knows Vance is in charge, as does Markham, but the feisty Heath is always trying to impress Vance by one-upping him and often skips ahead in his deductions to arrive at the wrong conclusion. In The Dragon Murder Case our party of mutual enemies soon head out poolside to relax with some swimming. Monty impresses everyone with his high dive but then sends the party into a panic when he doesn’t resurface from under water. After our spoiled young socialites give up the search for the night, Leland puts in an anonymous call to the police which sends Heath out to find the D.A., who’s involved in a game of billiards with Vance. Intrigued by the idea of the dragon pool Vance accompanies the men to the Stamm estate where their typical investigation takes an interesting turn when the cackling Mrs. Stamm insists that Montague has been killed by the dragon. After draining the pool Vance is only speaking tongue-in-cheek when he remarks that “There’s always the possibility of a water monster,” but the investigators soon find dragon tracks across the mud in the bottom of the pool, ratcheting up the possibility, at least to everyone but Vance, that there’s a real live dragon watching over the Stamm residence. I won’t delve further into the mystery other than to say that I didn’t find the solution as satisfying as the road towards it. I will disagree with period reviewer Mordaunt Hall of The New York Times, who couldn’t seem to make sense of the mystery once revealed. Hall writes that “the denouement is scarcely satisfactory, for it is not quite clear how Mr. Vance reaches his conclusions.” Well, yes to the first part, but no to the second. Vance discovers the key bit of evidence while taking a rest, reclining with a cigarette in a lounge chair. It makes perfect sense when he explains what he discovered. Referring to the suspects Hall also wrote “why they act so suspiciously is somewhat vague, but they succeed in deceiving the audience, which, after all, is the main idea.” It’s not at all vague. They all hate each other to begin with and motivations are revealed throughout for why. Whenever someone goes creeping around or flies off the handle an explanation is always provided. The Dragon Murder Case is as entertaining as any but the very best murder mysteries of the 1930’s and Warren William shows what is now obvious in retrospect, that he’s a fine movie detective. He’s believable as the smartest man in the room and his humor, while darker than usual in Dragon, is up to snuff. I didn’t mention her much here but Margaret Lindsay is a favorite from the era and she’s as much charm and beauty as usual in the part of Bernice. Unfortunately, other than being our host, Bernice doesn’t have a whole lot to do. Lyle Talbot doesn’t crack a smile, but that’s fine, he’s appropriately on edge throughout Dragon and he even trades barbs pretty well with William when Vance calls out Talbot’s Gale Leland about aspects of his Native American heritage. Eugene Pallette is always a delight, in contrast to Vance his Heath is usually the dullest wit in the room, however he manages to be so without turning himself into an object of scorn. The Kennel Murder Case, featuring Powell, is generally regarded as the best of the Vance films. In fact, noted film historian William K. Everson grouped Kennel amongst the best of the genre, with Green for Danger (1946) and The Maltese Falcon (1941), in a very interesting chapter of his 1972 survey of screen sleuths, The Detective in Film . In that same work Everson remarks that William “was a logical successor to William Powell,” but that Dragon was “a long way below the standards of Kennel,” largely because of Kennel director Michael Curtiz’ greater mastery of the genre over Dragon director H. Bruce Humberstone (87). Granted that despite my feelings that William is every bit as good as Powell as Philo Vance, the earlier movie is better in all aspects aside from the cast, though I don’t believe it’s worlds better. Not having read any of the original S.S. Van Dine stories myself I found Everson’s description of the character in print as “always right, but somewhat long-winded and pompous” about it better personified by William than Powell, which is a bit of a strange compliment, but the line made me say A-ha! while reading (38). Warren William would play Philo Vance once more, reprising the part at Paramount in The Gracie Allen Murder Case (1939). With apologies to Gracie fans, it’s pretty painful to watch. If you’re familiar with that bomb you surely haven’t read this far without thinking Fido Vance at least once! Bryant, Roger. William Powell: The Life and Films . Jefferson: McFarland & Company, Inc. 2006. Everson, William K. The Detective in Film . Secaucus: The Citadel Press. 1972. Hall, Mordaunt. “Movie Review: The Dragon Murder Case (1934).” The New York Times 23 August 1934. Cliff, I have never gotten to see this one, and have always wanted to. I was able to find The Kennel Murder Case at Netflix Streaming — I’ve seen that one, but it’s been a while so I put it at #1 on my queue! I don’t have TCM(sob) anymore (that’s what I call it officially since I don’t have it anymore — TCM(sob). I do have a cousin who will put it on DVD from the TV for me, so I’m going to see if she can do that this Saturday! I really liked your article, Cliff. In-depth, enough of the story to really interest me and have fun reading about – and I LOVE the pictures you found! I wish I could have them all to make a Warren William collage — I think he is so special. Thanks for the heads-up about Dragon Murder showing! Thanks, Becky! I just mentioned it to you on Facebook, but don’t miss Warren earlier that same morning in Employees’ Entrance – that one airs at 6 am EST. If you need it I’d be sure to see if they’d record that one as well. Oh, I have such lousy choppy copies on a lot of these (I’ll be recording them as upgrades myself!) that I’m always embarrassed by my screen caps! Very glad you like them, me, I wish I had still photos of all these shots instead! There was a wait for Warren William, though re-watching Kennel (as I obviously did before writing this!) they got around a similar wait for Powell but having his Vance at the dog show in the opening scene. He quickly departs and the story moves similarly with an introduction of the suspects, the crime, etc. I thought the same thing though w/Dragon–it’s like, shoot, we’ve only got 65-70 minutes here, where the hell is Warren! The Woman from Monte Carlo scheduled for Warren’s birthday…anything else? Beauty and the Boss, The Dark Horse, and Expensive Women too! All times EST. I can’t help but to think there could be another one at 6pm as that’s how they tend to program, but I clicked through every WW title on TCM.com and those are all I saw too. Wish they could have squeezed The Mouthpiece into this early grouping (6 pm … c’mon guys!). Just noticed December 2 is a Friday – very glad they’re doing something for Warren this year because TCM typically doesn’t do “birthday schedules” over the weekend, and Warren’s is on a Sunday in 2012. I’ll do a full post on this as we get closer. Got a lot of Lone Wolf movies on Saturday mornings in November-December too! Up next, Arizona on September 27.
it would great to have John Stangeland sit in with Robert Osborne to chat before each movie on that day too (since he wrote the book, John could send a copy for Osborne to look over while he is re-cuperating)…or, are there any still living co-stars of Warren’s that Osborne might invite for a chat? That’d be a beautiful thing @warren watcher, but we’ll need a Warren William night rather than day to get it – there’s no TCM daytime host during weekdays. Perhaps for next August’s Summer Under the Stars, if Warren could cop an entire day, 24 hours, then he’d have someone introducing his movies during prime time hours. There are still-living stars from his later movies, Angela Lansbury and especially Jimmy Lydon spring to mind. Shoot, even Dickie Moore from some of his earliest titles, though he was bit young then! Thanks Jeffers, got the email on this yesterday and immediately noticed Gracie Allen’s absence. Still, I’ll get it on the Shopping page as soon as Amazon makes it available.